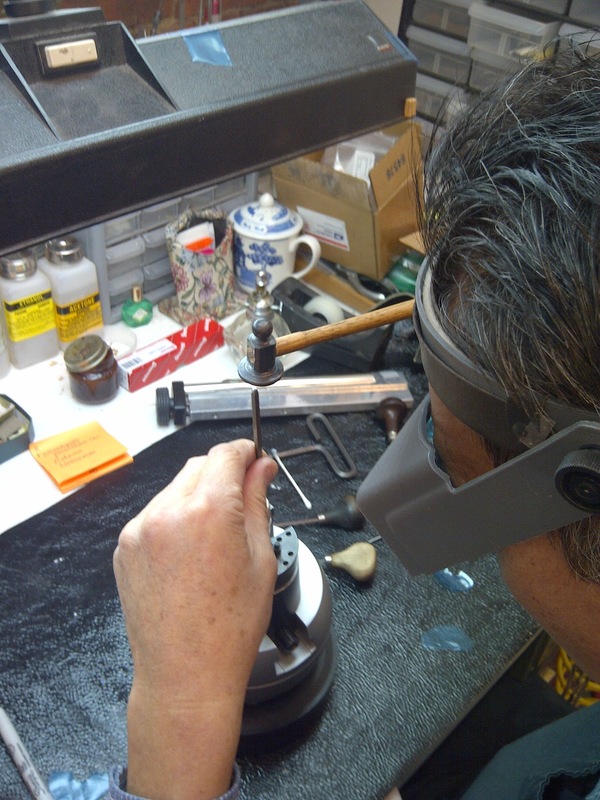 Last month, we posted on the subject of key engraving -- specifically, that it is best to have it done when you send in your flute for an overhaul. We recently had the pleasure of meeting with Weiling Zhou, one of our flute finishers and engravers. 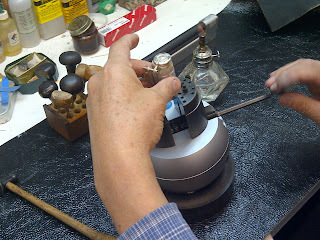 He explained the process to us and even engraved part of a key to demonstrate! Weiling has been engraving for 10 years. The very first time he engraved s flute, he used a very small screwdriver. He gave the flute back to the VP of Production here at Powell, Rob Viola, who liked Weiling's work and asked him to do more. At that point, Weiling felt that he needed to research the engraving process more, so he went straight to the library and checked out several books. Rob then provided him with an engraving bowl vase (which, by the way, weights 20 pounds! ), and he was ready to begin. 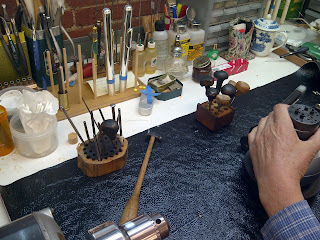 He has now acquired about 50 engraving tools, and each tool is used for a different line. He also has a book of engraving patterns he drew, although he has made many custom designs for people. Custom patterns can be especially difficult on lip plates due to their complex shape -- on which the pattern must fit! One of the most popular engraving requests he receives is for bird patterns. Weiling has several books with photos of birds that he uses for examples and to guide his engraving. When it comes to birds, Weiling tells us that engraving images of them from the side is easier, and some birds (like the eagle) are very distinctive. 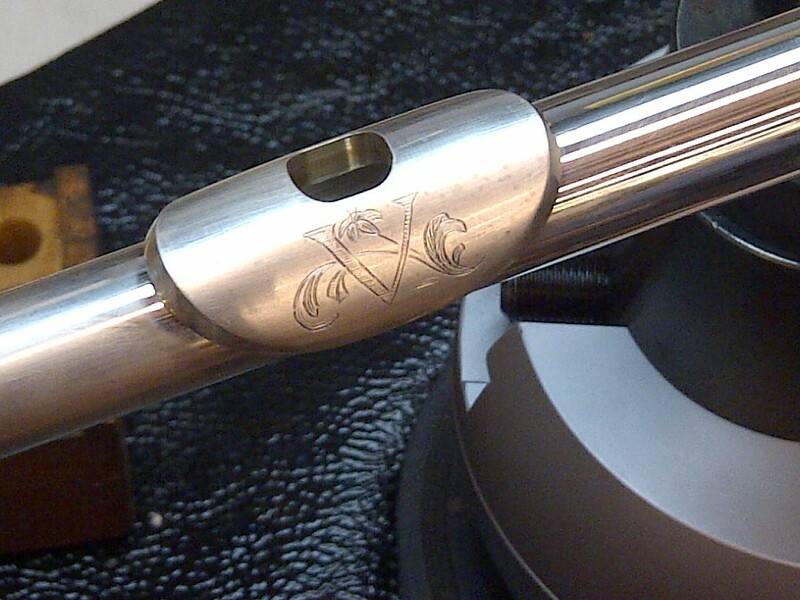 Because engravings do not have color, it may be difficult to tell the difference between a blue jay or cardinal -- so it's best to stick with something simple that looks good in black and white. 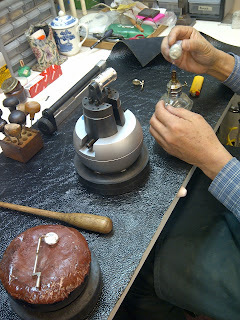 Initials are another popular engraving request, which Weiling tells us takes about 10 minutes. 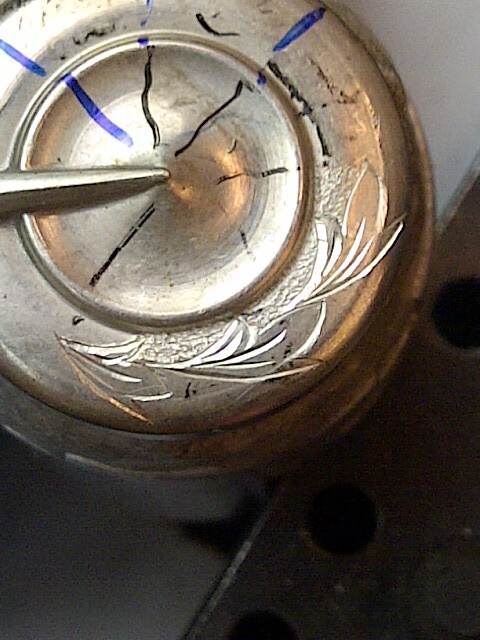 Engraving a key cup takes roughly 40 minutes. So, how exactly does the process work? Weiling showed us with the example of a key cup. He marks lines within the cup to help as guides and then sketches in the shapes or patterns to see, roughly, how they will fit and work best. 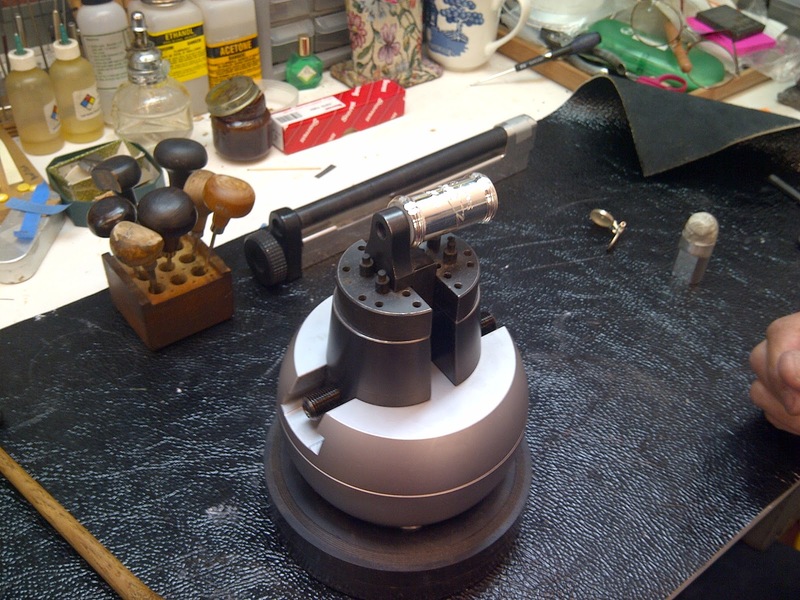 The engraving bowl vase can be adjusted to hold headjoints, barrels, and anything he is engraving. 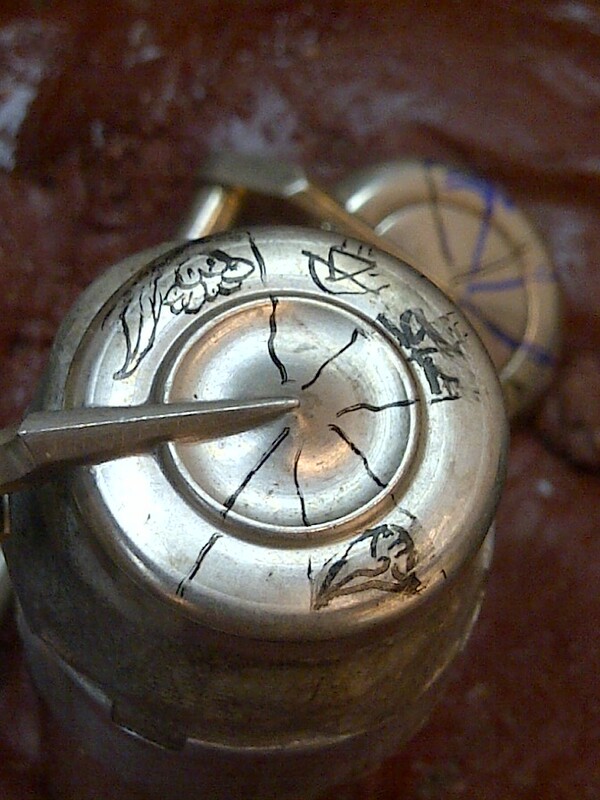 When it comes to a smaller part like a key, the key is first "stuck" to an adapter with a waxy substance known as pitch. He then takes the appropriate tool for the cut he is going to make and begins. 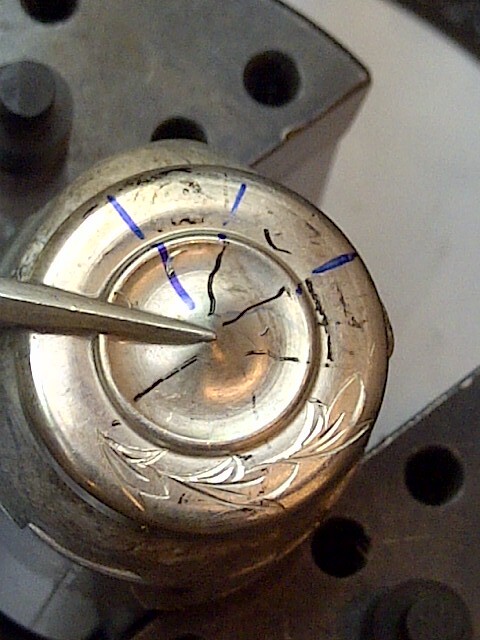 Because the bowl rotates, it makes it much easier to engrave something round like a key. 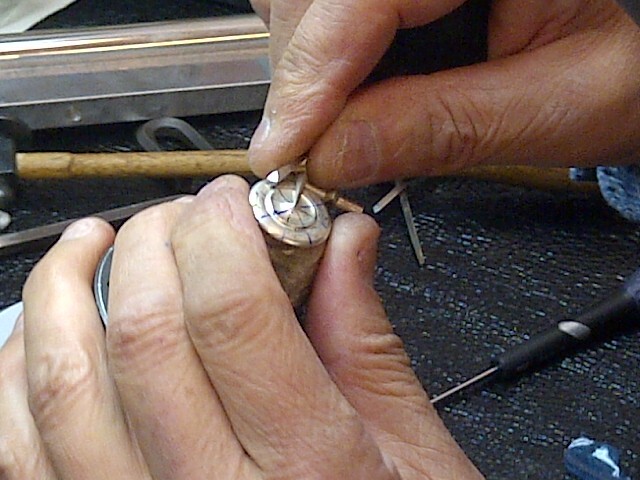 Each line is cut with a single stroke, and these lines are engraved in a series to make the pattern. To engrave texture, he uses more pointed tools and lightly taps them into the metal with a small mallet. We were quite mesmerized watching Weiling create these patterns and textures all completely by hand. He did mention that it is best to engrave solid metals because engraving through plating causes rust. So, if you've wondered whether hand engraving is really done by hand, well, we can see that it is! 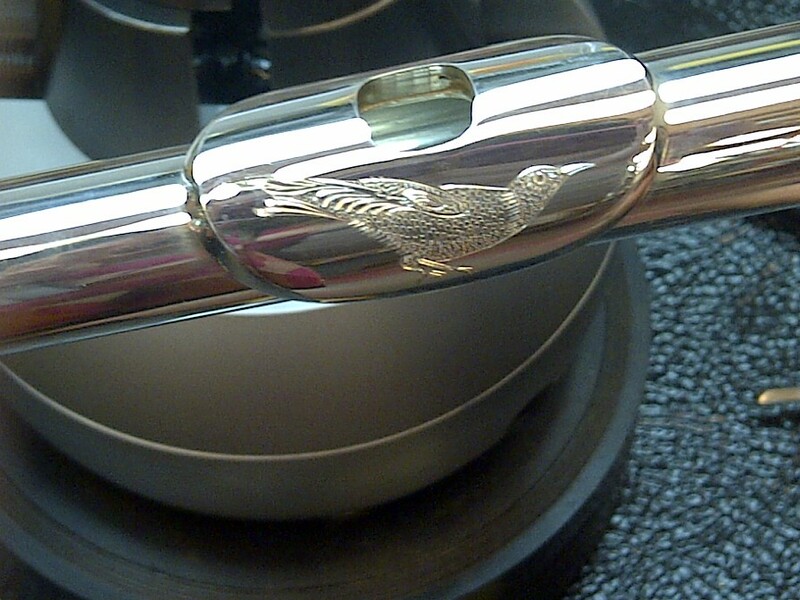 If your flute is not plated and you are interested in having engraving done, make sure to contact our Director of Service and Quality, Rebecca Eckles, and she would be happy to help. She can be reached at reckles@powellflutes.com or by calling (978) 344-5160. The adjustable engraving bowl (seen here with a barrel). 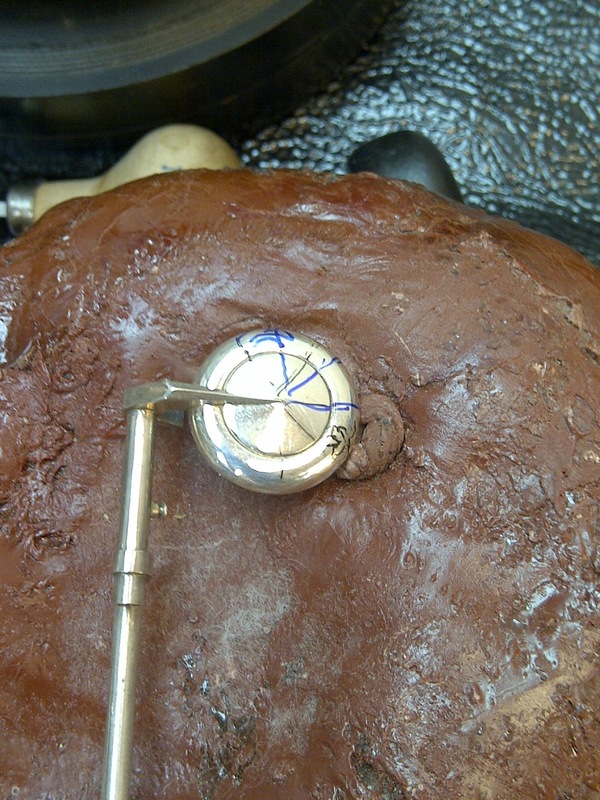 Weiling heats some pitch (wax) to hold the key. 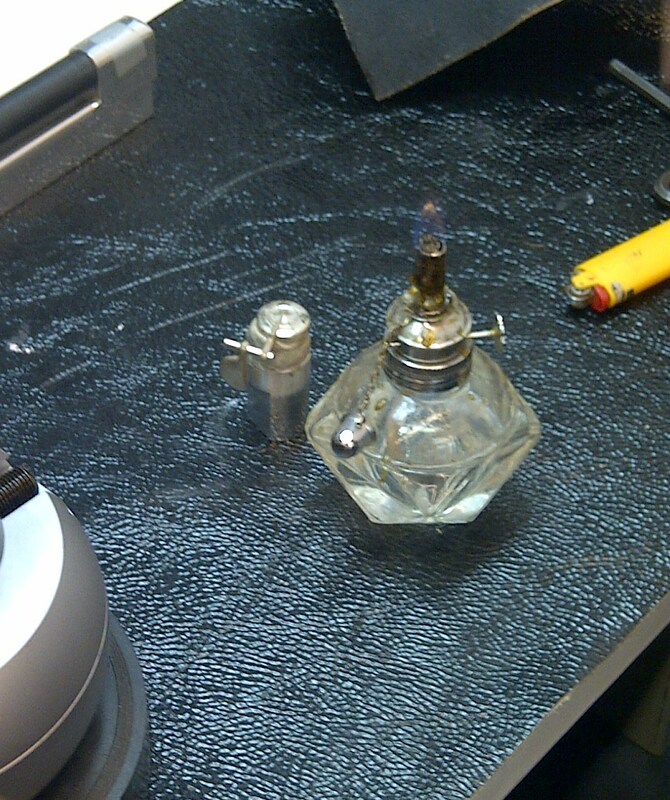 Key is now stuck to an adapter for the engraving bowl. 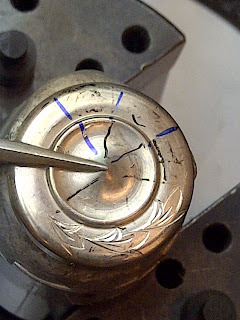 Adjusting engraving bowl with key in place. Birds are a popular pattern. Initials are popular as well. Guidelines on key -- key is held on a block of pitch. 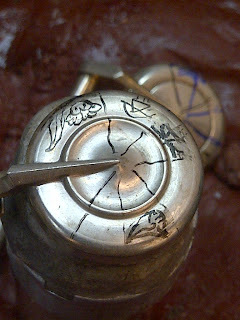 Patterns sketched on key cup. Cutting the lines of the pattern. Sample pattern completed for us! Different tool tapped with mallet for texture.